With every new Seat model, there will be inevitably a modified JE Design version! and that’s a good thing because this tuner always does a fine job. 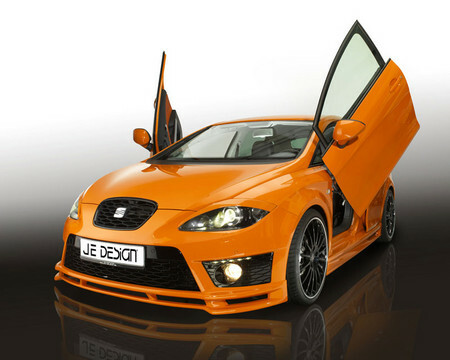 So what they have to offer for the 2010 Leon FR? Well, the first thing you notice on the car are the Lambo-style wing doors which alone cost 1499 Euros! The other parts of the kit consists of a new front spoiler with a double lip, side skirts, a rear skirt attachment and a rear diffuser. The car also gets a suspension system which is lower than standard by 35mm, 19-inch sport wheels with 225/35R tires and sport exhaust mufflers for the sake of a deeper roar. For the 2.0 lite TFSI petrol unit which has 211 hp standard, the tuner offers an ECU treatment which increased the power to 270 hp (199 kW). The maximum torque leaps from 280 to 355 Newton metres. And as for the 2.0 liter diesel engine which develops 170 hp in its factory form, they’ve come up with a new Can-Tronic unit which boots the power right up to 204 hp and the torque from 350 to 380 Newton metres.